It's one hour past quitting time, and the night before election day. I'm without sons, because I need to be in to work early to be on hand for poll opening, and it stings more than I'd like because it's the second night in a row without them. And while the quiet is good, the clean house is good, the not worrying about making supper for famished boys the instant we walk in the doors is is good... it's just too quiet. I walked in the door alone and threw on a pair of jeans. I ironed my apron that I washed yesterday and I threw that on too, insistent on ironing only because it's linen, and as casual as I am, the thought of wrinkled straps is just too much for me. I started to make the fritatta that Epicurious conveniently loaded to my phone homescreen when I was at work today, the one you might have gotten loaded on your phone too, with mushrooms, kale and kefir. I changed it a ton, adding feta and far less oil, and Spice House California Pepper mix and urfa biber chiles (because everything is better with them) thinking the whole while how I do this consistently... making something only loosely resembling the intended recipe. I put on some Dexter Gordon and started chopping veg for beef barley soup while I was at it, taking care to chop the carrots and onions and celery and mushrooms into the same sized squared pieces, taking care to admire them more than normal as the 18 minutes of "Tanya" elapsed. I thought about how a couple hours of cooking on a Monday night is making everything seem more bearable. How happy I'll be that I have that soup ready to eat at 5:30 on Wednesday evening when boy #2 is asking for his second piece of fruit and rummaging in the fridge drawer for cheese (hearing his little voice echo "Mommy, I really love soup" which is half the reason I thought to start some soup anyway). Halfway through chopping the soup vegetables, I pause to scrounge through the freezer, certain that I'm not out of chicken stock and dismayed that I am. Too little time to simmer stock, and too little inventory. I remember the turkey stock on my basement shelves that my mom pressure canned for me, from that turkey grown down the road from them that we enjoyed more than a year ago already, and I'm so happy for it that I say it out loud. I'm so happy for the skill to cook and eat real food that I praise my mom, my grandmother, and my great-grandmother all at once in the same breath as my feet flutter down the stairs, my heart quickening like I'll find some precious surprises there, and I do because my mother has just visited and she tidied up my shelves and added more tomatoes to them, my pop was here too and sorted through my winter keeper onions and they are beautifully tucked in a single layer now beneath the sack that I was too busy to remove them from, their errant skins removed to make the experience of choosing one even more downright pleasurable. How lucky I am to have such amazing parents. And I say so, again out loud, to myself in the quiet house playing with jazz on a Monday night. And now the fritatta is done, and I have let it cool, and I have thought how nice it would be if I were enjoying it with someone. I don't let myself think that for long because if that were the case I'd have to turn down the music, which has moved appropriately into Mary Lou Williams' Praise the Lord and then into a song from Cannonball Adderly's Country Preacher album. (I think how algorithms sometimes really get it right, and maybe that makes up for how many times they Really, Really get it wrong.) I think how a year has gone by without me writing so much as a paragraph on this website I bought a domain for, back when I thought that CakeWalk might turn into my livelihood. I sit down with my plain Buffalo China plate in the light of my computer screen and eat. A year has somehow passed and I am nowhere near where I thought I'd be, not that I ever had any idea of where I'd be a year later. Now I settle in. For the waiting. A little lonely maybe, but happy. Remembering to savor each bite of the feta/kale/mushroom fritatta, even if it's eaten while typing because I'm nothing if not a multi-tasker lately. Remembering that I have a whole half a life left to live, even if I'm not really living it the way I'd like right now. It's started raining really hard, and I add being thankful for a warm, dry place to live to my list of blessings. 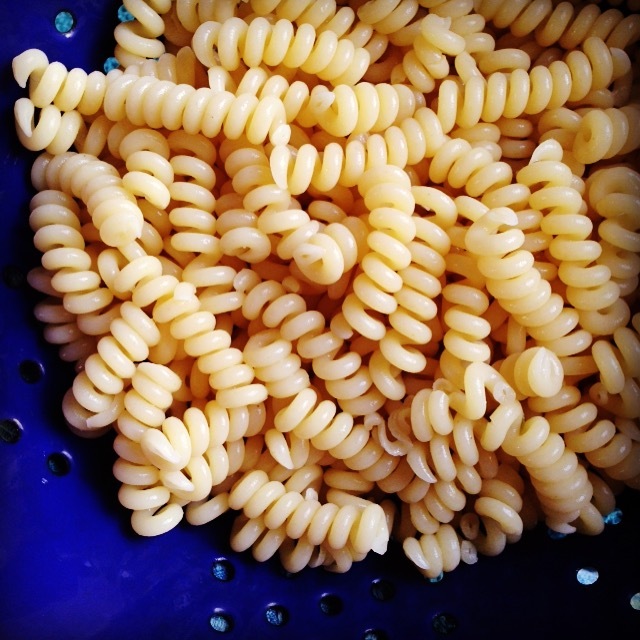 I'm writing a blog post with no recipes and no pictures, and who will read it even. I'm waiting on a pot of soup. Pete Townshend has come on, Pure and Easy. I wish I could say I was making it up. But algorithms, man. If I were a musician and not a home cook it may fit better, but still I'm going with it. So 6 months have passed. My year of change has slowed down somewhat, into a new routine of workdays and weekends. 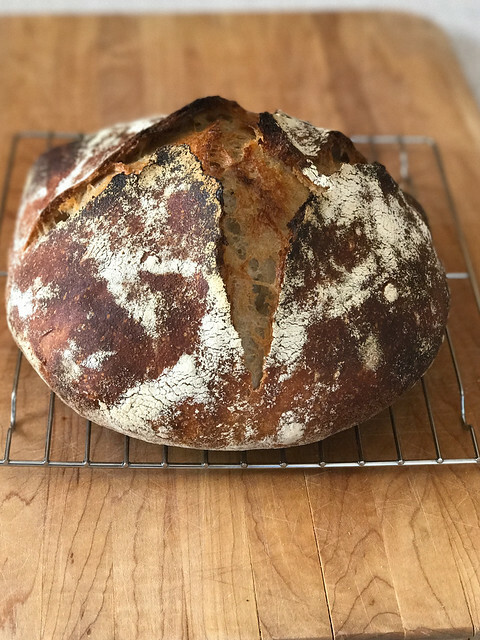 Kitchenwise (and in general), I have changed in more ways than I can count - but in all this while and with all the changes, I have never given up on baking bread. Going back even as far as 3 years, I can see how my personal bakery has changed too. In regards to sweets, far less of them have come tumbling from the oven - in part because just about everyone I know is also cutting way back on them. 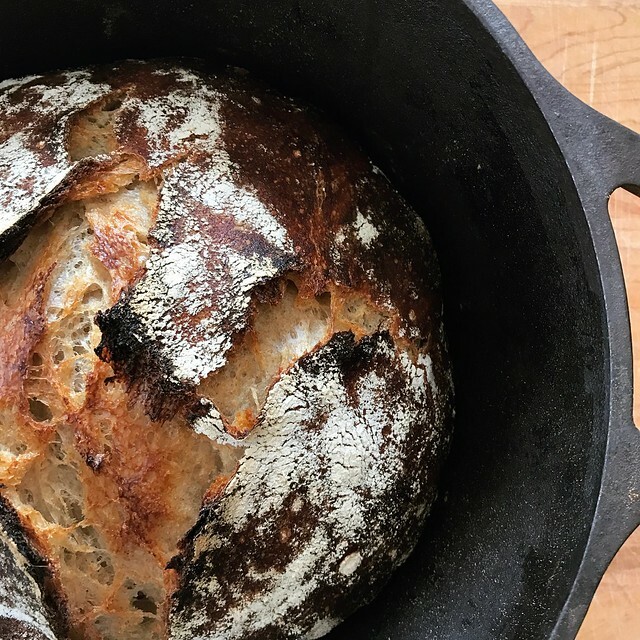 But bread bakery is different; while I have baked consistently since that first baby starter was birthed back in 2010, the past several years found me adding a pinch of commercial yeast to my wild breads. When I started on my bread journey, I thought this was cheating and I never (ever) did it. But commercial yeast is reliable, and when trying to juggle a new baby and homeschooling, I grasped that trick with both hands and held fast. So much so that I have found that I was almost nervous to go back to full-wild bread. What if I've changed so much the bread knew it too? What if I went back to airless loaves that were no joy at all to eat? I'm happy to say that since the dawn of the new year, I've gone back to full wild levain breads, and not only are they consistently good, the curve to get back to them wasn't as steep as I'd imagined it would be. Another push that I needed for my bread change came recently when I was able to buy a grain mill from a friend who needed to downsize. It's a Magic Mill: as old as I am and working fantastically. I discovered Anarchy Acres' heirloom wheat, and before committing on a bulk sack of wheat berries, I've been using their Turkey Red which is sold in bulk at my co-op. I haven't yet worked my way up to loves made fully of fresh milled flour, but I'll get there after I buy some sieves to more effectively achieve the extractions I need. The biggest hurdle of full wild yeast bread for me at this point in my life is time. The years I was able to spend at home were truly a luxury in so many ways, especially for one who loves to make things from scratch. I always had more time than money, and in retrospect especially, I wouldn't have wanted it any other way. If I'd never had those years, I likely wouldn't have stumbled on real bread baking in the first place and that is too depressing to imagine. STARTER NOTE: Forkish loaves are built on 80% hydration starters, and I keep a 100% one. The morning of the day I want to start bread, or 7-10 hours ahead of time, I mix up enough 80% for use in the loaf. In this case, I mix 25g. 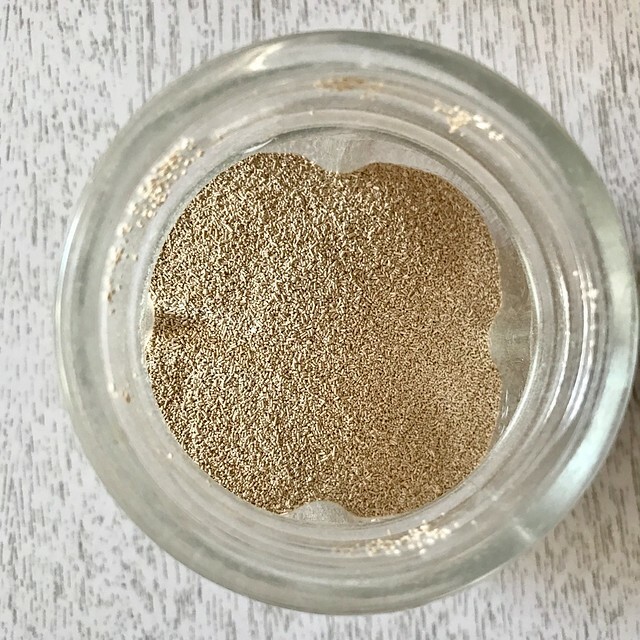 starter (my 100%, or "liquid levain"), 25g. whole wheat flour, 100g. white flour, and 100g. water and let it sit covered at room temp until I'm ready to continue - usually 5:30 PM. This amount makes enough for 1 loaf of bread. If making 2 loaves, double it. Around 5:30 PM, mix white and wheat flours with water and autolyse for 30 minutes. Then, add salt and starter and mix well by hand until well incorporated. Bulk rise for 12-15 hours give or take, until about triple in size, folding 3-4 times before bedtime. I'm pretty loose on this timing, it can be every 30 minutes, or just as you remember as you are walking by. The loaf I made today, I totally forgot about and did 3 folds about 20 minutes apart just before bed last night, a full 5 hours after mixing and it was absolutely fine. We have been sick a record number of days this winter, and I blame mild weather and having a boy in day care for the first time. Last weekend I was down for the count, not baking or cooking or eating or caring about any of it. This bread for the grilled cheese abovewas from the week before, and I couldn't help but be so thankful for it for lunches after I got my appetite back. Well over a week old, and it was still stellar toast with a truly lovely, deep flavor. This is only part of why I can't give up on bread. The real stuff has keeping power, and it makes a meal all by itself, or enhances a meal I get the time to make. Working with dough somehow keeps me grounded, thinking that one tiny part of my old self is still in there and kept alive and thriving. I try not to think about it too much, it becomes overwhelming - kind of like putting words back on a page after a half a year of silence. You know the silence wasn't there without reason, but you can't figure on why the words are not just pouring out all over... instead it's like coaxing, pulling them out, unsure of a purpose. I guess my purpose was more utilitarian in detailing my baking notes for my last four or so loaves of bread. For those that might still keep an eye on what happens in my tiny corner of the Internet, I'm still here. I'm getting stronger. 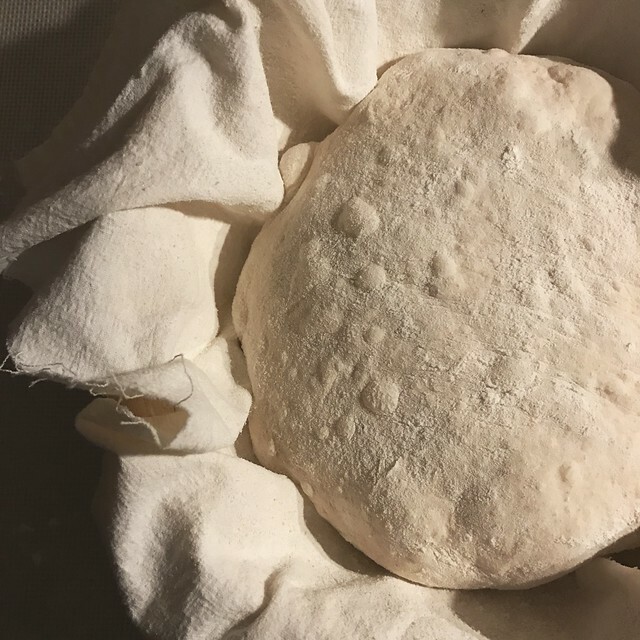 I'm getting more confident with wild yeast again. I'm still baking. I'm not giving up. The season of small batches. There is no denying that I feel unproductive in my homelife lately. It just can't be helped. But I suppose, there is still quite a lot coming out of the kitchen despite my deficit in time. It helped that it barely rained this summer, rendering yard work nearly extinct. It helped that I realized I should listen to all the radio I miss out on while cleaning up the kitchen post-kiddo-bedtime, rendering my precious evening hour or so to myself more productive and blessedly multi-tasked. And then there is vinegar, which transforms fruit that just can't make it into jars, extending the seasons in my glass with the addition of seltzer water - a truly healthful alternative to the hard drinking that I could probably justify if I were that type of girl. The Wisconsin tart cherry season ended at least 3 weeks ago, when I dumped the 2 lbs. I intended for jam into this half gallon jar succumbing to the realization that I was not going to pit them and jar them and enjoy them on toast. Ever since, they've been steadily turning the vinegar deeper and deeper red - vibrant fuchsia really - a truly almost intoxicating smell rising to meet me as I take off the lid every few days and procrastinate a bit longer for straining out the pits and fruit and maybe adding some sugar and decanting it into some jars. 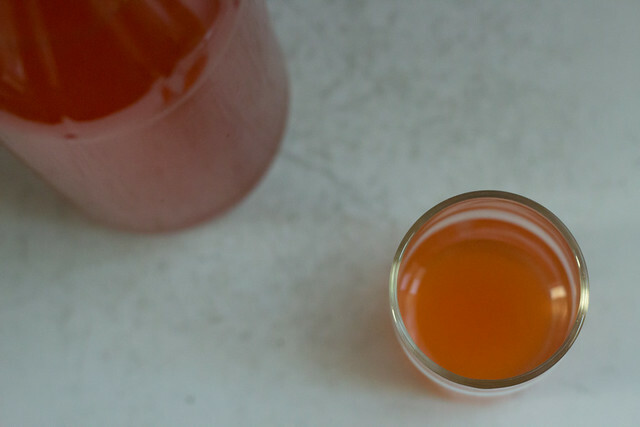 I've done drinking vinegars for the past handful of years, doing them all pretty much the same. A cup of Bragg's vinegar (or enough to cover) to 1 lb. 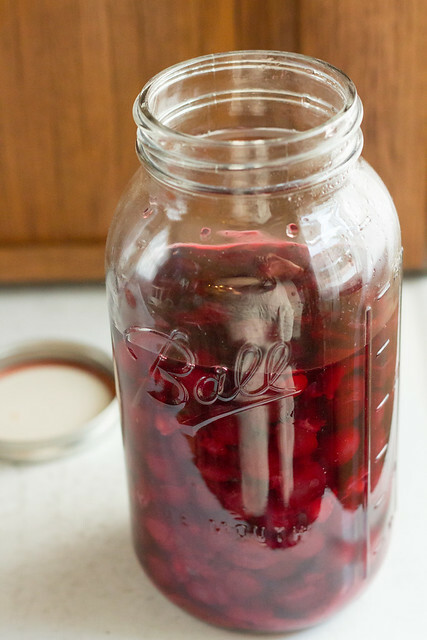 of fruit or berry, soaking for a week (or 3 as I procrastinate). As my rule of thumb, I add up to a cup of sugar for every cup of strained fruit vinegar. Usually, I am happy with a half cup sugar per cup vinegar which was the case with the peach puree vinegar I made more than a month ago with perfectly ripe Georgia peaches. That season has passed, but now the Washington peaches are upon us, and I may have to make more to hold me through the winter. Last weekend, I canned 2 pints of dilly beans (Food in Jars' recipe) and 4 pints of giardiniera. 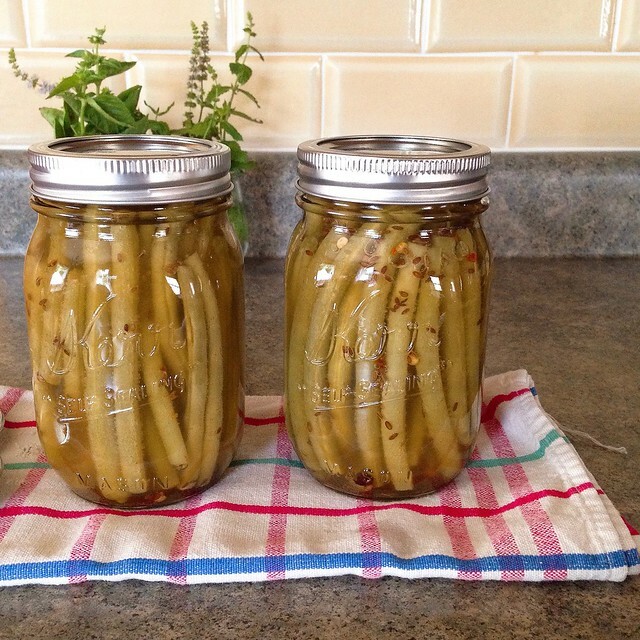 My canning episodes took place 24 hours apart and I tried not to be hard on myself that I was wasting energy (both environmental and my own physical energy) heating water on separate occasions to bathe jars. 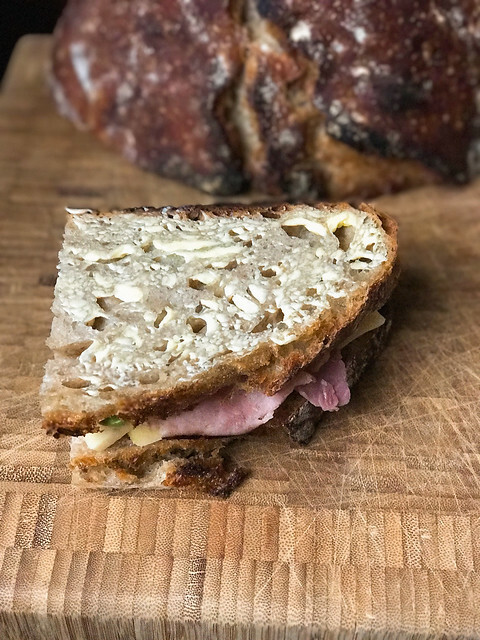 I'm taking my triumphs where I can get them, and am happy that when I get a taste for my favorite sandwich, the few pickles I was able to make will have my back. I got a surprising amount of jam on the shelves too. 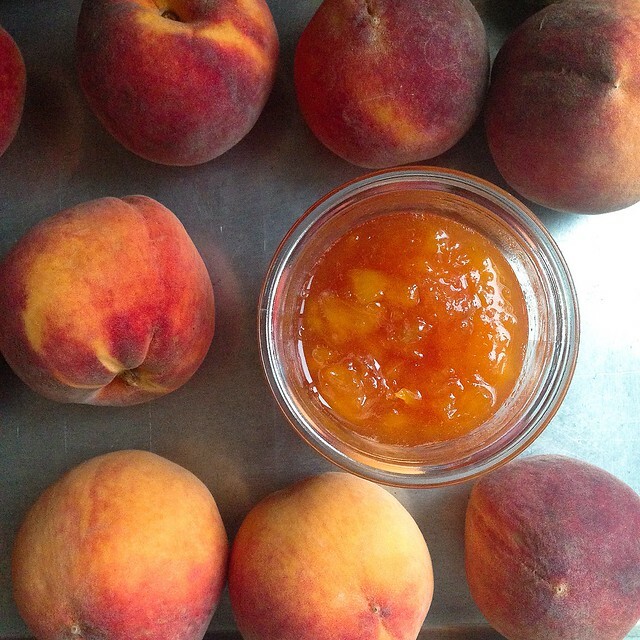 I was particularly thrilled with the Foolproof Preserving book that America's Test Kitchen put out; the most perfect peach jam I ever made was their recipe. It used a shredded Granny Smith apple in lieu of pectin, and there was no peeling of fruit. I have 4 half pints in my basement, where I'm trying not to open them until at least October. The run over made the best peanut butter and jelly ever. I feel devoid of words lately, instead posting Instagrams with brief glimpses into my changing world, which still manages to include quite a bit of homemade stuff. So many people have reminded me this is a season, and not necessarily will it last forever. Logic confirms this, but I also know that I tend to stick things out for the long haul... and that in the back of my mind, I can see me pulling 20 years at my new job in the blink of an eye while all the seasons of impossibly small batches get easier and more approachable as I adapt to work outside my kingdom. But maybe the best is yet to come. One reminder of midwestern living is that there is always another season as much as you love or hate the one that is currently upon you, that as surely as it is 85 and humid, it will be 10 degrees and snowing. At least during those 10 degree work mornings, I will have some peach jam. Where do I start? With more than 2 months of silence here in my food world, it's kind of tough to know where to pick up. I think the best place to go is back to 1988. I was a 5th grader in a new school. Newly moved from a rural, northern Wisconsin woods home, my 5th grade year was the only one of my life at home with my parents that I spent in a city setting. There wasn't a school bus that picked me up a full hour before classes began, there was my Dad behind the wheel and my brother and I in the back seat. And every day, as far as my memory serves, we listened to Los Lobos' La Bamba soundtrack on cassette. Each morning, we would start at the beginning of side A, and most mornings we'd arrive at school somewhere around the time Charlena began. Every single day, my Dad put that in for us at our request; I don't recall that he ever just got plain sick of it. It was just that year, 1988 - and after that I was sold on Los Lobos for life. By the start of my 6th grade year, I sat in the back right hand side of a big, yellow school bus at 7:10 each morning. In the years that followed, I had a Walkman and could listen for that hour before school started to La Bamba or whatever else I had on tape as we wound along through the country roads, catching sight of foxes and cows, rolling hills. But for the minutes between our city house and school in 1988, my father let us listen to the same dozen songs over and over and over. This hit home as so much change in my world has me taking my boys to spend their days away from me. Late in the school year, in my oldest boy's new school, his music teacher introduced him to Bob Marley. He came home one afternoon singing Three Little Birds, and by the first day of summer camp at the new center where both of my boys are fortunate to go together, we put Bob Marley into my CD player - I've spent so many years behind a wheel of a car with a broken CD player that I forgot I could use it once again. "Mom, can we listen to Three Little Birds?" After a couple weeks of that request every single morning as we hopped into the car, I started to question why I even had a Bob Marley CD anyway. Again? There are hardly any words in that song. Maybe in the third week in I actually thought about those few words - my littlest baby singing in the back seat: " 'Cause Every Little Thing's Gonna be All Right". And it's true, it is. The days go by, I feel like I'm marking time in a world I don't belong in any more, but every little thing continues to be all right. I have had to drastically change my approach to a homemade life. 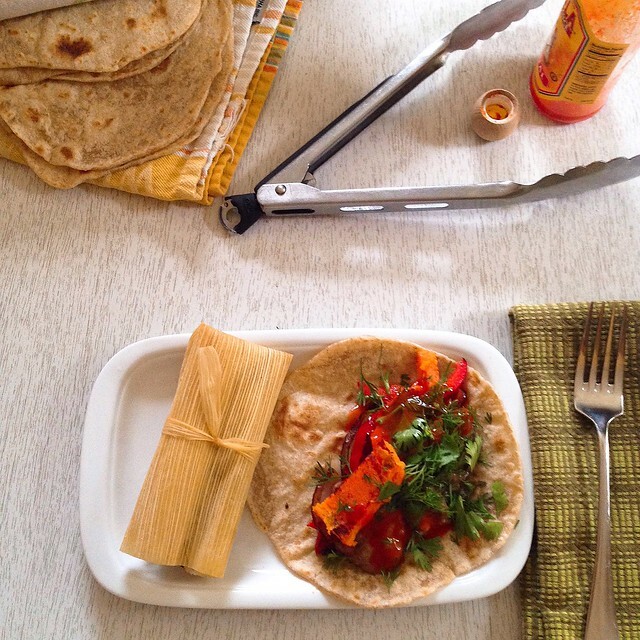 What I make is still homemade, I just make a whole lot less, eat a whole lot less, and cook much less frequently. But often, when my world looks dim in the evening, when the weight of things seems overwhelming... Friday nights especially when that crown jewel of the work nights comes to a head and the weekend looms over like this 48 hours of workweek armistice or something... I stand around my kitchen perplexed and overwhelmed and when I throw onions in a pan and start heating them up, something happens to my sorry state. Something marvelous. Because that is all cooking really is for me, even more than the means to eating well and enjoying the company - it is certain truths I know to be true. My memory of my old self comes back, and things become orderly on my plate once again. My boys ask to put Three Little Birds on in the dining room, and I say that it's fine and we all sing along. Because it's good to remember that every little thing is going to be all right. The winner of the Strawberry Ancho Preserves is Ellen H.! I know you'll love this jar of jam, Ellen, and I can't wait to hear how you enjoy it! My other big plans today include prepping galette dough for a dinner later this week and going to forage for a few ramps, after that sleepy little one wakes up. Maybe we'll grill some ramps along with walking onions, which are proliferating down my backyard hill and out into the field, walking the way they do. I'm trying to organize my thoughts in a way that don't revolve around meals and Monday being wash day. It's all too easy to be sad, and yet, the sun comes pouring in and I am overwhelmed with the divine providence of it all and just how thankful for each moving piece that has perfectly slid into place. Off to the next adventure!